The 5215 series satisfies the requirements of many applications on PCBs for a precise, secure, compact and space-optimised design. The pin and female header series complements W+P’s range of friction lock headers in the field of surface-mounted SMT components, and is accordingly ideally suited for economical automated assembly. SMT wire-to-board connectors are designed for a cable cross-section of AWG 36 – 30, and are also available as a single row version in horizontal design with a 1.2mm pitch. The current rating of the copper alloy contacts is 1 A, the insulation material satisfies the flammability rating UL94V-0, and the temperature range of -25 to +85°C offers reliable functionality. 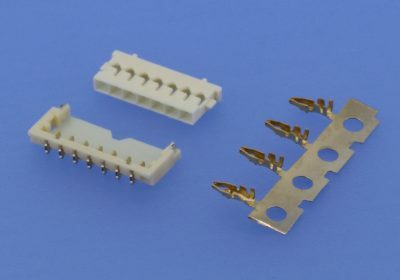 In light of the market trend towards miniaturisation, compact wire-to-board connectors are currently in high demand and they bring with them interesting solution possibilities, for example in the fields of instrumentation and control technology, communication engineering and medical technology. « Electronics experts met at ‘electronica’ in Munich!